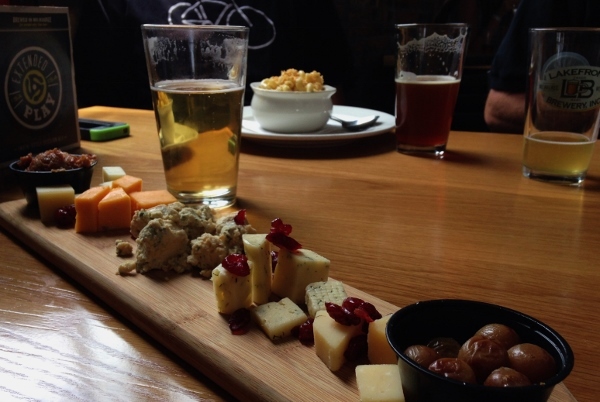 On our recent trip to Milwaukee, Wisconsin, we had both local beer and cheese on our must-try lists. We were able to knock out both in one stop at Lakefront Brewery. Lakefront Brewery, makers of many varieties of gluten-full beer, also happens to be the brewer of New Grist, the first gluten-free beer to be granted label approval by the U.S. Government. Not a gluten-removed beer (which I don’t drink because I’m super sensitive to gluten and am not willing to risk it), New Grist is made with sorghum, rice, hops, water and yeast. While I would take a hard cider over beer any day, I was not going to miss the chance to visit a brewery where I could actually have a beer. 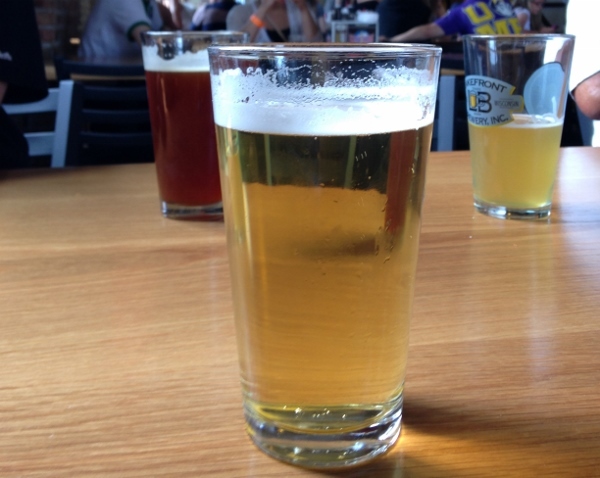 Lakefront Brewery is also the nation’s first organic beer brewer. Lots going for this place! Situated in the Riverwest district of Milwaukee, Lakefront Brewery’s early 1900’s building served as a coal-fired power plant for many years. The building was later sold to the City of Milwaukee and used by the Forestry department. It’s hard to tell that now, as it looks like a classic beer hall. Exposed brick walls, high ceilings, large windows with a view out across the river. Rows of tables line the hall, which is a bit noisy, but festive. 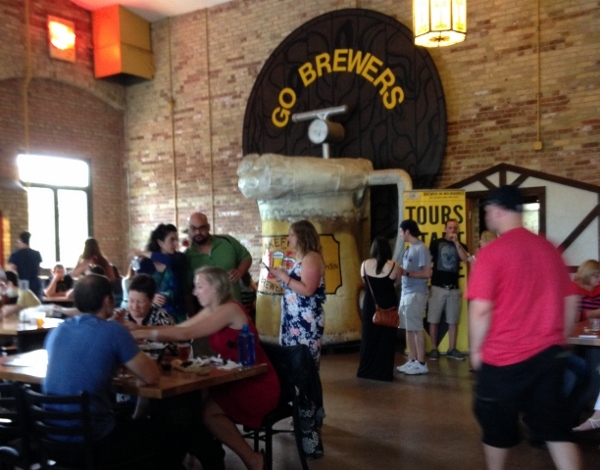 Tour guides for brewery tours are constantly making boisterous announcements to gather the next tour group while servers run food out from the kitchen. Best to keep your eyes open for your food because it’s common for one table to have multiple parties waiting on food and numbers are easily overlooked. Beer is ordered from one counter, food from another. We waited a good amount of time for food, but beer was served promptly so the waiting was certainly tolerable. We were also there on a holiday weekend, so that surely contributed to the crowd and wait time. And cheese! I had an amazing assortment of local cheeses. I had a goat bleu, SarVecchio parmesan, dill Havarti, Gruyere and a five year cheddar. If you are gluten-eater, this can come with artisan bread. It also includes dried cranberrries, a cherry-bacon jam (passed down the table to our carnivorous friends) and pickled grapes. I had never had pickled grapes before, but immediately started experimenting when we got home. Pickled grapes may be my favorite food find from our Wisconsin trip! If you are looking for a more substantial gluten-free meal in the same neighborhood, there is a Bel Air Cantina not far from here. I didn’t dine at that particular location, but had two incredible meals at their Wauwatosa location. Extensive gluten-free menu offered and kind staff. Eat With: Moderate caution. It is busy, loud and hectic here. It’s a beer hall, after all. Make sure your order is properly noted to reflect your dietary and allergen needs. 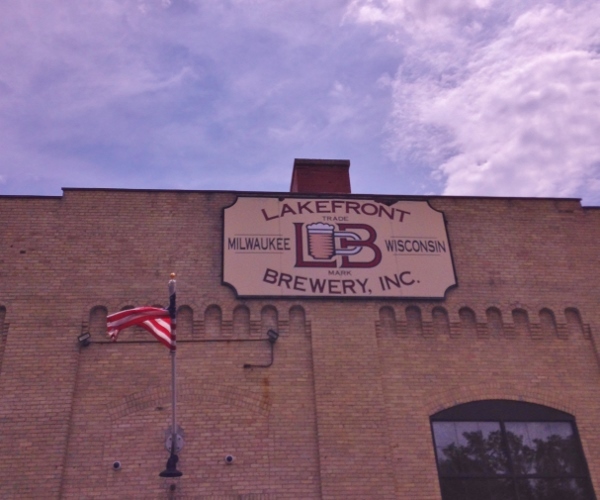 Lakefront Brewery is located at 1827 N. Commerce Street, Milwaukee, WI, 53212. 414.372.8800. We parked on the street near the brewery with minimal trouble even on a busy day. I’m linking this post up to Gluten-Free Wednesdays. Click over for many great recipes, dining recommendations and gluten-free living tips!